This small oil painting by Trevor uses coloured threads of paint to make up the action of the subject. Interlaced throughout the picture they form the basis of the movement and expression. 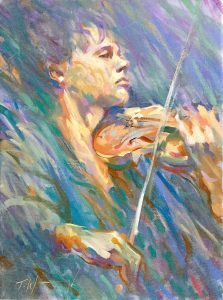 The diagonal strands of colour intermingle in the eye to further enhance the action and mood of the painting, giving the viewer the feel of the performance taking place. The subject is partly obscured in the coloured mosaic with edges being lost and found and the swirling, bravura brushwork further enhances the feel of excitement in the performance.